Find on my new section entitled “DIY” under CREATE on my site! 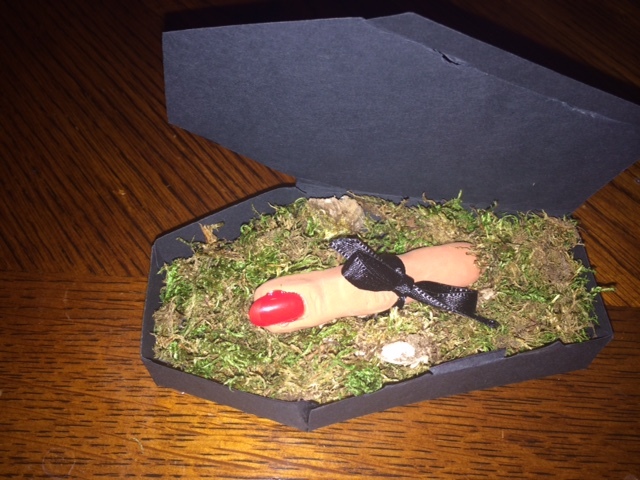 So for these severed finger invitations, I was inspired by Martha Stewart but had a much lower budget than what was required to purchase supplies listed on her site. 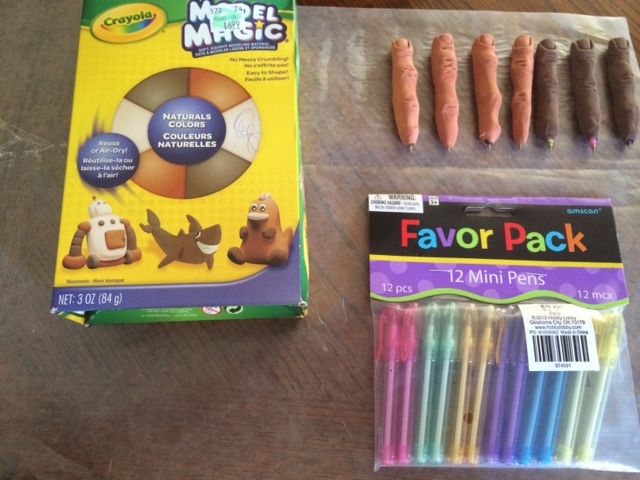 I became creative with using Crayola Model Magic instead of Mold rubber and decided to add the finger to a short pen for a keepsake that guest will remember this party by. 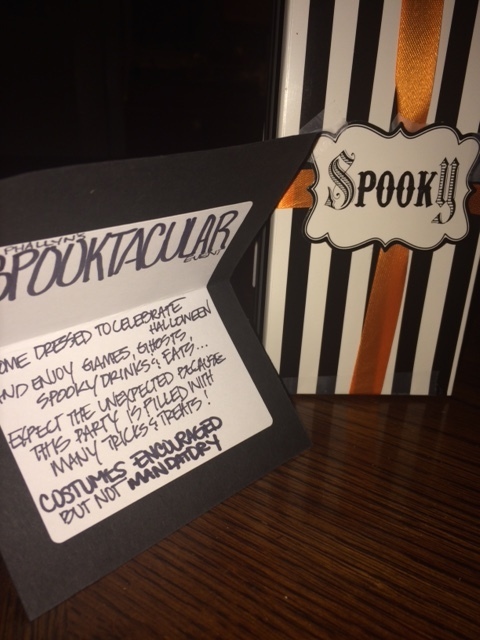 Here are the supplies needed and steps to create this invitation for your upcoming Halloween Party! 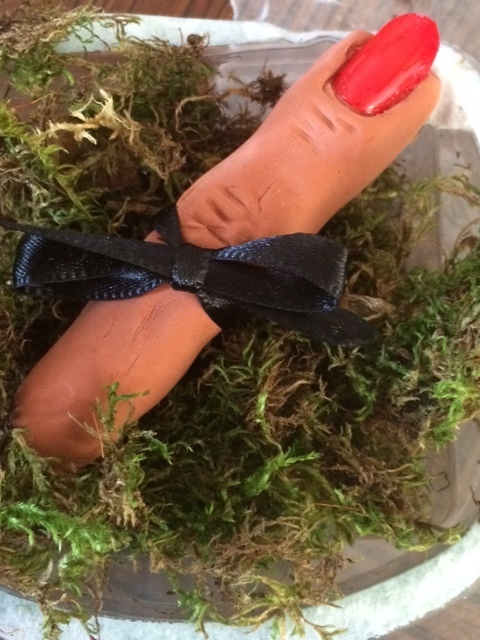 When creating the finger, I used my finger as a model. When using the Crayola Model Magic you only need a little. A little stretches a long way. Take a ball and roll it in your hands to then stretch it the size of the mini pen. Depending on the size, more skinny finger or fatter finger will require more or less of the Model Magic. Wrap the Model Magic around the pen and make it flat at the top. To create the finger look, press down in two spots that will allow the knuckle to raise (creating a lump) as well as a lump toward the end of the pen. To create the fingernail, Take the false nail and press down and back to create indention but then remove once created. Add about three to four lines on the knuckle and toward the bottom of the finger to make look real. (I used a butter knife and toothpick to make these lines). Once you create the finger exactly as you like, you will need to let it set for 24 hours before adding the nail and decorating it more. 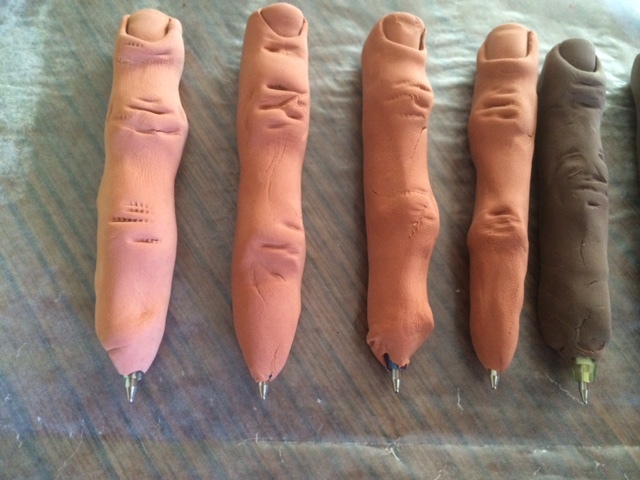 be sure you close the finger really well ensuring only the tip of the writing pen is showing… nothing else. I also found the more wrinkles you create and the more imperfect you make the finger… the better they come out looking real! So I debated back and forth because the fingernail was not as scary as I wanted it to be… To me it was more “cute” LOL and the goal was to be scary similar to witches fingers! Anyway, if you choose to add the nail, paint your nails first. I bought regular manicured false nails and painted them red. Let those dry overnight as well. When you are ready to add, use a small drop of crazy glue to ensure it sticks and does not come off. While those items are drying you can construct your box and invite. You can choose any color card stock you like. 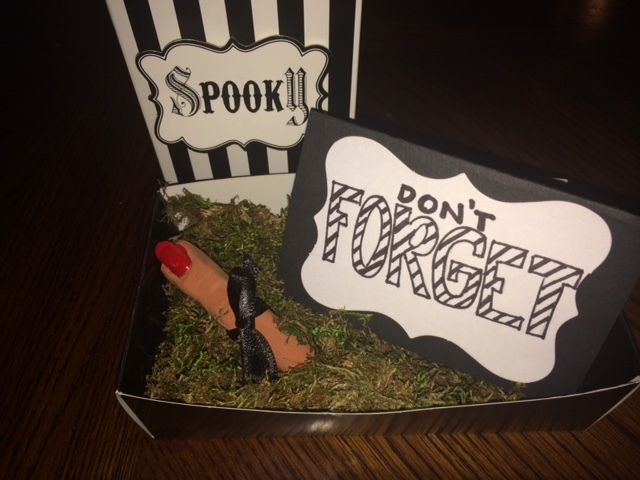 Originally I made miniature coffins for each finger but I didn’t consider it would be difficult to mail these miniature coffins. #epicfail So I had to go with plan b which was to just create small boxes in more sturdy card stock paper. 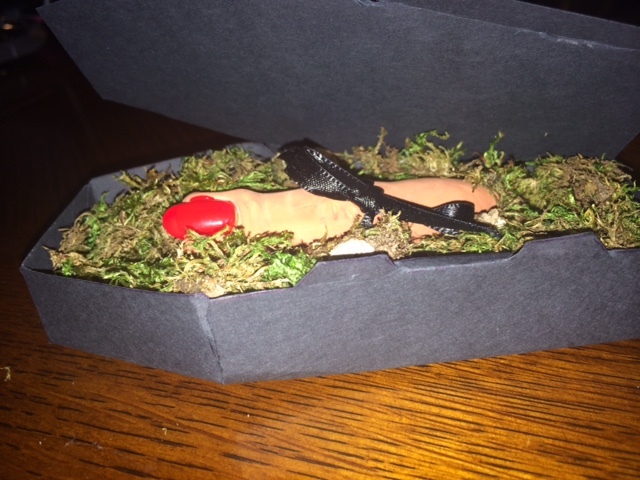 If you choose to do the coffin, you can find an easy print out HERE which I printed one and chose to cut out on black card stock for more classic and grown up look. Or go this route… simple box. I cut the card stock in 3×5 squares and attached a white label to write on inside. I then folded the card in half. Easy peezy… right? 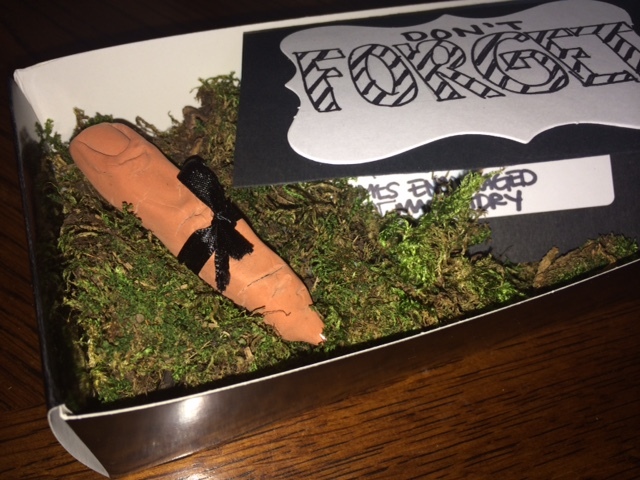 I then constructed the box, added moss to look as if the finger is coming out of grass. I tied a small bow from the black ribbon as a “don’t forget” look. I then added the finger and invite. 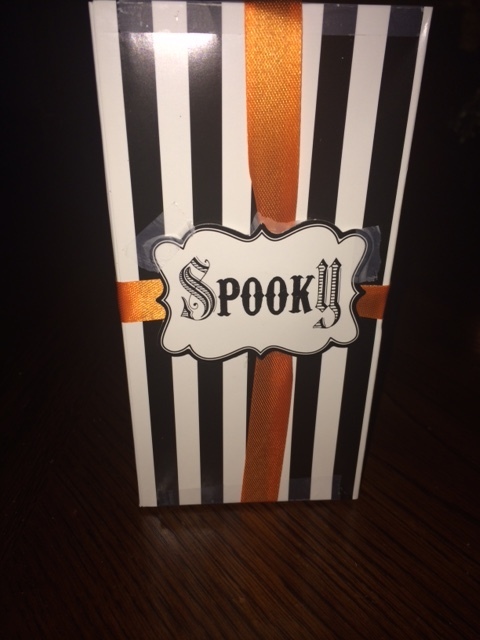 I sealed and tied my orange ribbon like a present then super glued the “spooky” sign which you can also find at Hobby Lobby to give them anticipation as they unwrap! Tell me what you think and if you will try!